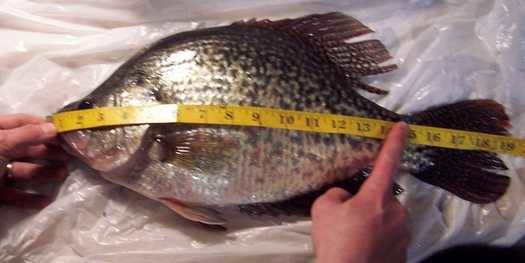 Shortarmguy's Crazy Emails: Did you hear about the 4 1/2 -pound crappie? Mike Zimmer was enjoying a phenomenal morning of crappie fishing. Then, it nearly turned historic. The 33-year-old angler from Menomonie was fishing a lake in Menomonie on March 15 when he hooked a 4 pound, 5 ounce white crappie. Most crappie caught are in the half- to 1-pound range. Mike Zimmer and the 4-pound, 5-ounce crappie. - Provided/BND "It was unbelievable," Zimmer said. "It's probably like catching an 8- or 9-pound bass or a 70-pound flathead (catfish). 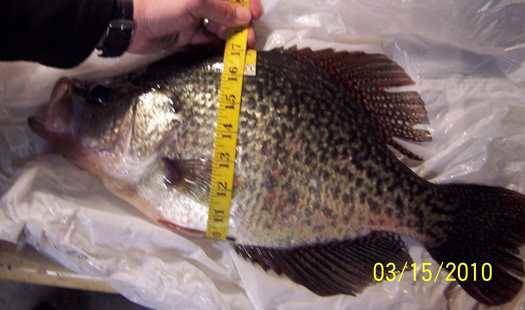 Crappie fisherman know just how big something like this is." 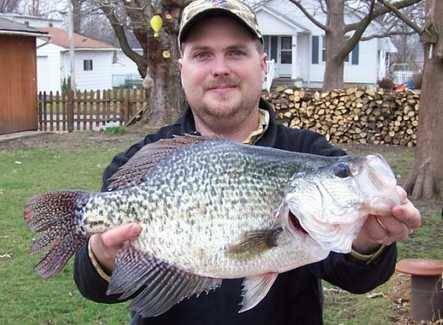 The behemoth that measured 19 inches long and had a girth of 16 inches was part of a crappie bonanza for Zimmer. He started fishing that chilly morning -- the temperature was about 40 degrees -- at 7:20 a.m. By 10:30 a.m., he was already at the dock with his limit of 25 crappie. Among the keepers were a 3-pounder and one that weighed 3 pounds, 8 ounces. The previous day, Zimmer also caught his limit of 25 in under four hours. That's why he declined to reveal the name of the lake that harbors his crappie honeyhole. "Next thing you know, they'll be people all over the place fishing for crappie," Zimmer said with a laugh. Clad in his thermal duck hunting clothes, Zimmer was one of the few fishermen on the lake that morning. The nippy temperatures didn't faze Zimmer, who said he has been fishing since he was in diapers. "For me, I've always caught my bigger ones early when it was cold," he said. "For most people, they would not even go on a day like that. It wasn't ideal by any means, but it was for me." Zimmer was using a 12-foot crappie pole outfitted with 4-pound test and a slip cork. His bait of choice was a Grizzly jig tipped with a small minnow. Knowing the crappie were preparing to spawn, he was fishing in shallow water (between 2 and 10 feet) around some downed trees. It didn't take long for Zimmer to realize he had landed on a school of crappie. Big ones, too. "I had beaten my own personal record (3 pounds) on the 12th or 13th keeper of the day," Zimmer said. "The 4.5-pounder was the 23rd keeper. I knew I only had three more fish to go, and here I catch this one." When he hooked it, Zimmer didn't think it was a crappie. "I'm thinking that's a catfish because it stayed down low," he said. "It didn't want to come up. A muskie will do the same thing. They'll put a good fight up and not come up to the surface. "After a little bit of fighting I started to see it, and I realized it was a crappie. All I could think of was that 4-pound test breaking, because I knew it was a big one. I don't know how long I fought it because all I was thinking was getting it in the boat." Once he landed the papermouth, he collapsed into his seat due to a combination of exhaustion and excitement over his catch. After he caught his breath, Zimmer weighed the crappie on a hand-held scale. It came in just under 4.5 pounds. Zimmer then had the fish weighed on certified scales at the Millstadt post office and a butcher's shop in Sparta . The fish is currently at a taxidermist, where Zimmer plans to have it mounted. Coming oh-so-close to breaking a 37-year-old record didn't seem to bother Zimmer, who is a chemical operator at a plant in East St. Louis . "It might even be better than catching the state record because I might have gotten more publicity than I wanted," Zimmer said. "Then, I would have really had to give up my spot." News of Zimmer's near-record catch has been making the rounds. "My brother, who lives in Waltonville, had someone come up to him saying 'Man, did you hear about this dude that caught a 4.5-pound, 3.5-pound and 3.25-pound crappie?'" Zimmer said. "He's like 'Yeah, I did. I seen them because he's my brother.' I guess news like that gets around pretty quick."